We’ve officially crossed the threshold into autumn, that time of year when the air is crisp, the leaves put on a dazzling display of color change, and the mercury starts dropping into sweater-and-jacket weather. It’s an inevitability when snow will wallop us and cover the ground in a thick white blanket, but luckily, it doesn’t usually start off that way. Instead, we start off with a light dusting or soft snow that isn’t too heavy, a snowfall that can be easily taken care of with a single stage snow blower. Because we’ve got an amazing price going on with our Toro single stage snow blowers now until Halloween, with fast free shipping, we’re going to take a look at the benefits of getting one of those machines to handle the lighter loads. Winter will be here before you know it! 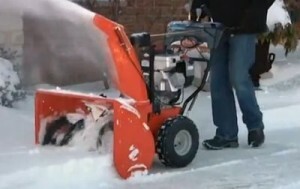 Get ready for snow season with a brand new snow blower from SnowBlowerSource.com. We have the best deals on Ariens and Toro snowblowers! See the promotions below for more details. Looking for a snowblower that’s durable enough to last through many winters to come? Any Ariens 2 stage snow blower purchased between August 1 and November 15, 2013 will receive a free 5 year warranty! This is an upgrade from the standard 3 year warranty offered on Ariens snowblowers. For a limited time only, receive a free warranty extension from Ariens. Instead of the standard 3 year warranty, you’ll get an unbelievable 5 year warranty! Murphy’s Law says that if you buy a snow blower this winter, it won’t snow enough to need it. Put your fears to rest with our Toro snowblower promotion. You’ll get your money back if it doesn’t snow! Any Toro snowblower purchased and registered between August 1 and November 15, 2013 is eligible for the promotion. Don’t lose out on the best deals around! Our snow blower sale on Toro and Ariens give you the best price around, plus an extended warranty or money-back offer if it doesn’t snow. Free shipping on all orders to the lower 48 U.S.! No tax on any orders shipped outside of Minnesota. $20 instant savings on any purchase totaling $1299 or more.